On the third day of indefinite fast in the Narmada Valley, hundreds of villagers entered the Narmada waters and observed jal satyagraha, "challenging" the Madhya Pradesh government’s "plan" to displace 40,000 families by closing gates of Sardar Sarovar Dam allegedly without any rehabilitation in the Narmada Valley. Shyama Behn, Bhagirath Dhangar, Saraswati Behn, Devram Kanera and others, who took part in jal satyagraha at Badwani, off Gujarat border, speaking on the occasion, asked chief minister Shivraj Chauhan, whether 40,000 families of Narmada valley, millions of trees, their cattle, farm-barn, temple-mosques, schools and entire ancient civilization were not a part of India. "Can’t the government, pretending to give water to Gujarat, see the people of Madhya Pradesh, their livelihood, forests and rivers? 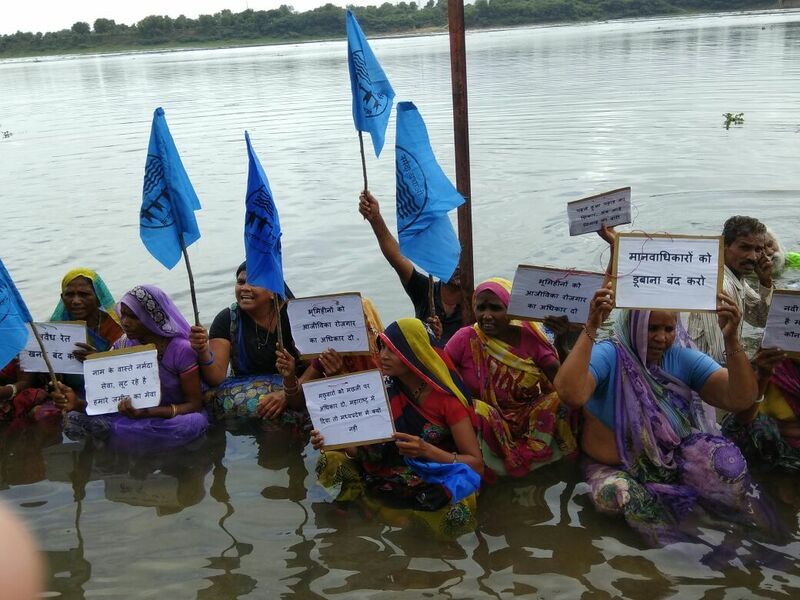 Will the Narmada Valley be sacrificed by the government for the private profit?” they asked. 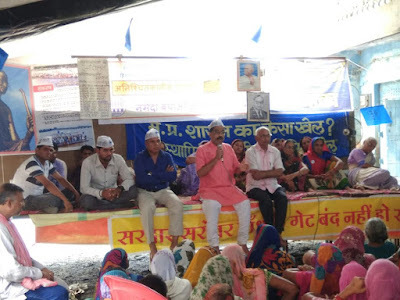 Ramesh Patel, MLA, Badwani (Congress) came to the venue where Narmada Bachao Andolan (NBA) leader Medha Patkar and others are sitting on hunger strike, and extended his full support to her. Shailesh, a project affected person belonging to the Aam Aadmi Party (AAP) came along with 10 other supporters to lend his support, announcing that from August 1 the party would launch Save Project Affected and Save Madhya Pradesh yatra. Those who would join the campaign include party MP Bhagwant Mann and state party convener Alok Agarwal. Congress and AAP leaders said, heavy rains in Gujarat have completely exposed the current situation where the branch canals are not ready and not managed, but still the politics over Narmada water is being played. Even as the jal sstyagraha is on a large number of National Disaster Relief Force (NDRF) detachments have reached Badwani. NBA said, "This clearly shows that despite knowing about the tragedy, the government is deliberately working against the people. As the water level increases, there will be havoc in the valley, a completely man made disaster." Reports from say, in Gujarat, all the Narmada canals are flooded, suggesting Narmada waters cannot hope to go to the farmers. As for Madhya Pradesh, it does not need power produced at the Narmada dam's power house because it is suffering from excess capacity, purchasing power from private power ventures at a very high cost, even as shutting down the government power ventures. "There is no need of water from the dam or electricity, then why is the state of Gujarat and Madhya Pradesh forcing flooding and submergence in 192 villages of Madhya Pradesh by closing the dam gates? ", an NBA communique says. It adds, "Gujarat is in the midst of floods, the government is giving compensation of Rs 50,000 to the flood affected people in Gujarat and Rs 2.5 lakh to the dead. Such a situation could have been averted in Gujarat if the government had planned decentralized water planning to manage excess water." Insisting that at the current level of water in the dam, there is enough water for the irrigation and drinking purposes, NBA says, "Water is being diverted for the Coca Cola and car factories located in the Narmada command area." Meanwhile, support from across the country continued, with a number of solidarity programmes being held. 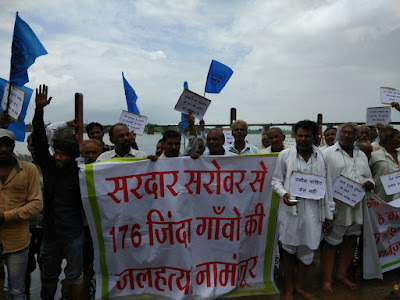 These included protest by the Kisan Sangharsh Samiti in Tapti Sarovar of Multai, Madhya Pradesh; by Mahakaushal support groups, which includes CPM, AAP, Barghi Dam Visthapit Sangh, and others; and by several groups in Bhopal. Others who held solidarity programmes were Kisan Sangharsh Samiti, Kisan Sabha, Chutka Parmanu Sanyatr Virodhi Sangharsh Samiti, Janvadi Mahila Samiti, Madhya Pradesh Mahila Sangha, Bhumi Adhikar Andolan, Aadivasi Kisan Mazdoor Sangathan, Manav Adhikar Seva Sangh, Dalit Adhikar Sangh, and Bundelkh and Mazdoor Kisan Shakti.